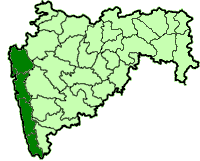 The Konkan is a coastal strip of land bounded by the Sahyadri on the east, and Arabian Sea on the west. It is a land where mythology breathes side by side with economic growth; a land with rich mineral resources, dense forest cover and a landscape fringed with paddy, coconut and mango trees. Mythology says Lord Parshuram the sixth incarnation of Lord Vishnu, created the region. After cleansing the world of evil-forces several times, he is said to have come and rested in Konkan, blessing the area with his presence. Little surprise then that the only Lord Parshuram temple in the country is found in Konkan, near Chiplun, in Maharashtra. Konkan was also the area where Vasco Da Gama landed in 1498, leading a European onslaught that eventually led to the colonisation of India. Incidentally, spices, especially pepper, so attractive to early European traders, grow abundantly in the region. Shivaji Bhosle, also known as Chhatrapati Shivaji Raje Bhosle (19-02-1627 to 03-04-1680) was the founder of Maratha empire in western India in 1674. Using guerrilla tactics superbly suited to the rugged mountains and valleys of the region, he annexed a portion of the then dominant Mughal empire. He is considered a great hero in India particularly in the present-day state of Maharashtra, and stories of his exploits have entered into folklore. This region- was the home to the first organised Indian Navy, set up by the great warrior king Chhatrapati Shivaji Maharaj. Shivaji saw the strategic importance of the-region and the need to have a strong navy to defend this long coastline from European invaders. He did that by setting up a naval force as well as by building strong sea forts along the coast. Some of these forts, like Vijaydurg, survive to this day, a testimony to his vision. Further proof of it importance Shivaji attached to Konkan, is the fact that the massive Raigad fort, which Shivaji made his capital, also guarded the trading route between Konkan and the hinterland. The Konkani people are a group of people who speak Konkani. Their mother tongue is Konkani. The word Konkani derives from kum, meaning 'Mother Earth' and kana, meaning 'piece/part' thereby meaning a strip of land along the western Indian coast beyond the Western Ghat mountains called as Konkan. The language they speak as well as the people itself take the name from the region where it originated. The Konkani people primarily speak Konkani although a very high percentage are bilingual. This is because Konkanis are spread out across the western coast of India,and dwell in areas where they have to interact with other people on a daily basis. They can be found in the Konkan Division, Goa, Canara and small pockets in Kerala.